Celestron's C5 Spotting Scope is a 5" (127mm) aperture, 1250 mm f/10 Schmidt-Cassegrain optical system. Its optical excellence is the reason it was chosen by NASA for many space shuttle missions. The C5 spotting scope is an ideal choice for the serious bird watcher, nature lover or anyone who enjoys beautiful views -either from your home or in the field. At just six pounds in weight and 11 inches in length, this spotting scope is a completely portable visual and photographic instrument that performs well in any viewing location. 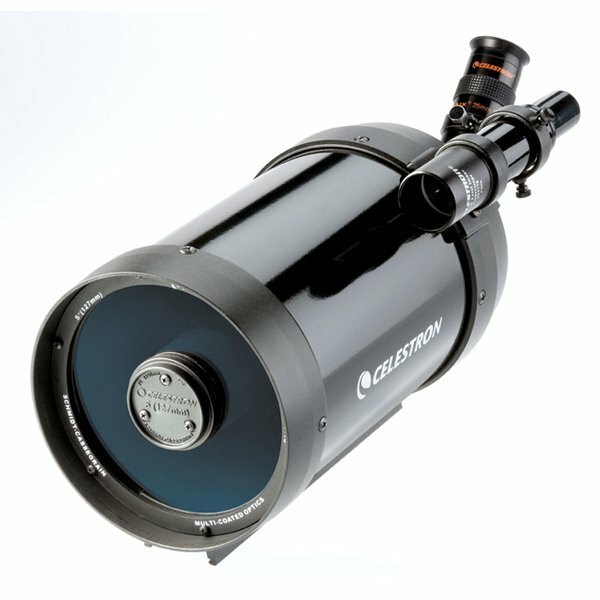 Further, Celestron offers a wide variety of optional accessories to expand the capabilities of this special instrument. The C5's aperture of 5" allows it to easily outperform smaller aperture spotting scopes. Offering 4½ times more light gathering ability than a 60 mm spotting scope and 2½ times more than an 80 mm scope, Celestron's C5 is the clear choice when a powerful instrument delivering brilliant, crisp views is what you require. The C5 spotting scope is a wonderfully versatile instrument, and its near focus of approximately 20 feet allows you to observe plant life, wildlife, birds or insects with ease. At the same time, the C5 can also be used as an astronomical telescope. In addition, the C5 goes easily from working as a powerful spotting scope to being a high performance 1250 mm f/10 telephoto lens. Photography couldn't be easier, because the C5 is designed to be fully camera adaptable. To take professional quality shots with the C5, just attach the correct optional T- Adapter and T-Ring for your 35 mm SLR camera to the back of the C5 spotting scope, and you're ready to shoot. The tripod adapter block on the C5's tube makes easy work of mounting the instrument onto a tripod for either viewing or photography. The C5 comes complete inside its own soft sided carrying case.